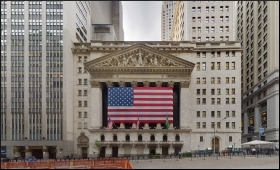 US stocks rose as Wall Street became more optimistic about potential progress in trade negotiations between Washington and its key trading partners while digesting some key economic data. The Dow Jones Industrial Average on Friday jumped 336.25 points, or 1.38 per cent, to 24,706.35. The S&P 500 was up 34.75 points, or 1.32 per cent, to 2,670.71, Xinhua news agency reported. The Nasdaq Composite Index rose 72.76 points, or 1.03 per cent, to 7,157.23. Trade-sensitive stocks Caterpillar and Boeing rose 2.18 per cent and 1.57 per cent, respectively, among the best performers in the 30-stock index. All the 11 primary S&P 500 sectors advanced, as energy and industrials led others higher. Eight of the 11 groups increased more than 1 per cent. Technology climbed about 1.5 per cent, boosting the Nasdaq. Tesla shares plunged 12.97 per cent, leading the decliners in the Nasdaq. The company was reported on Friday to cut its full-time staff headcount by about 7 per cent as it ramps up production of its Model 3 sedan. Netflix stock sank about 4 per cent. The US online streaming giant reported mixed fourth-quarter results on Thursday, with earnings exceeding estimates while revenue missing them. On the economic front, US consumer sentiment index fell to 90.7 in January from 98.3 in December amid growing concerns over US economic growth, said the report released by the University of Michigan on Friday. The reading missed market consensus. US industrial production rose 0.3 per cent in December after a revised 0.4-per cent gain in November, in line with analysts' estimates, according to data released by the Federal Reserve.